Pond ducks are a very pleasant sight in any pond. Their appearance shows that it has been maintained in a manner that makes it attractive to wildlife. For those who want to attract ducks, below are some tips that will help you do it. Ducks are a type of aquatic bird that is plumed and which resides on almost every continent which includes the sub-Antarctic. They feed on fish, insects, amphibians and worms. Some species can forage far below the water’s surface and are capable of capturing molluscs from mud. Unlike other birds, ducks should never be fed bread as it will harm them while polluting the water. 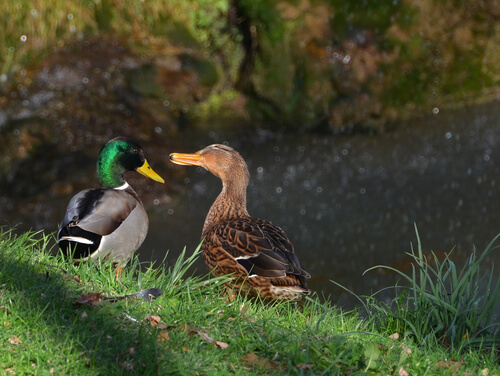 Ducks also make a quacking sound which in smaller ponds or water gardens may annoy homeowners or neighbors. In order to attract them you must first understand their needs. Ducks come in many varieties and the two species which frequent ponds the most are mallards and Muscovy ducks. They are omnivores and as such they eat a wide selection of food. Ducks prefer large amounts of space and water and they feel at home around aquatic plants such as water lilies. They also like tall grass in marshy areas where they can conceal themselves and create nests. The first step in attracting ducks is to install berry bushes. These along with mulch will attract insects and worms which in turn will attract ducks who will feed on them. A mess hall should also be created by establishing feeding areas which have platforms which are low and large. Ducks need a place to nest so to attract them you will want to setup a nest box. This could include a hollow log or grassy areas which provide concealment. Ducks are also fond of the sound of moving water and splashing, which is why you will want to install waterfalls and fountains. Perhaps one of the cleverest ways to attract ducks is with through duck decoys. By placing a pair of artificial ducks in the pond which float the actual birds will be attracted to them, swooping down to investigate. Once they see the beauty of your pond and all the food that is available they will want to stick around, which is what you want. The best decorations for a duck friendly pond are those which are natural. Make use of logs which are partially submerged, marginal, brush piles and aquatic grass. Ducks will not consume your fish as is the case with the Blue Heron. However, if a group of them visit the water quality of the pond can quickly deteriorate. This can be resolved by adding healthy bacteria, but ducks will also bring in weeds and they may attract cats, raccoons and other animals that wish to prey on them. However by taking a few preventative measures, many of these problems can be avoided, allowing you to enjoy the presence of these wonderful birds.